Until half way through track 11; frequency response good, stereo imaging fairly good, a little distortion and noise. Running a bit fast. After; frequency response is ok, stereo imaging ok, a little distortion and noise. Can be improved with some EQ and denoising. Also running a bit fast. Possibly made from two different transfers or maybe a problem with the tape, since sound changes a bit at the beginning of La Do Da. Can be improved by a remaster. Here is a site with some pictures by a photographer, Register to view links and Register to view links. 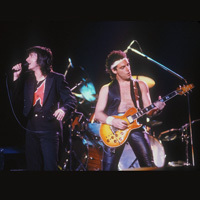 Journey went on to play at the same place in 1986, before the actual Raised on Radio tour had started. The full concert in 86 was recorded and a few videos have been released from it. One of my favorite early Escape era shows. Thank you for posting it.